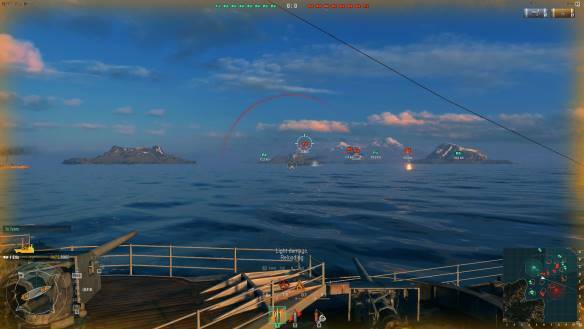 In World of Warships (WoWS) players can experience what it was like to take command over their own ships in the midst of World War 2, fighting in brutal naval battles in an exciting and strategic shooter based free to play MMO. With multiple nations technology trees to explore, unlocking dozens of different combat vessels, players can upgrade and customize their ships before heading into team based battles against players or challenging AI opponents. The game is the latest addition to the “World Of” titles from Wargaming, adding to World of Tanks, World of Warplanes, making the battles of World War 2 cover land, air and now sea! The four available nations in the game are Japan, USA, USSR and Germany, the last two being the newest introductions to the game that give access to their own new tech trees. Each tree is a list of the available ships from the era broken down into four ship classes: Destroyer, Aircraft Carrier, Battleship and Cruiser, players can earn XP points as they compete in matches and spend these points to unlock new ships and upgrade them. Players are not restricted to only advancing down one nations tech tree, they can unlock and purchase any ships they have access to and play each of them in battle. Battles themselves consist of team vs team matches against other players for PVP or against the AI in Co-op, in each match players must try to earn points by capturing and holding certain locations on the map or by destroying the enemy ships. If a player is destroyed then they can continue to spectate the match or leave to use one of their other available ships to join another match; the previous match will still continue and they will still be rewarded for their participation and the ultimate result. Combat is a blend of forward planning, thoughtful positioning and slow and steady movement to reach a target location, but this methodical approach to battle can quickly change as ships start firing at each other, trying to outmaneuver one another and launch ambushes from the cover of nearby islands. A players individual role is generally focused on how they can help the team as a whole, with some ships being faster and equipped with scout planes this makes them ideal ships to get to the front, pick out enemy locations then pull back whilst the larger Battleships pummel them into the ocean. Cruisers and Destroyers can afford to get a little more up close and personal and can be fitted with torpedoes to offer them devastating firepower, but requires more precision and a direct line of sight on the target to be put into use. Aircraft Carriers support their team from the backline launching planes into the skies as offensive and defensive measures, but must be protected by their allies as they are extremely vulnerable defensively and they can quickly be taken down by a sneaky opponent. World of Warships - Bonjour, Battleships!